Metal casette dishwasher-safe filters are easily removed for quick cleaning. 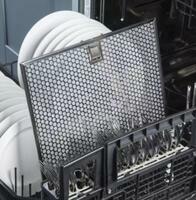 Stainless steel dishwasher-safe filters are easily removed for quick cleaning. Mounting Height: 24" - 30"
We cook a lot of food in high heat and this fan can pull the smoke and odor out of the house with no problem. We also like the style of Blomberg Hood. We did research and feel We made the correct selection. I am really happy with my purchase, it works really good, it is moving a lot of air. 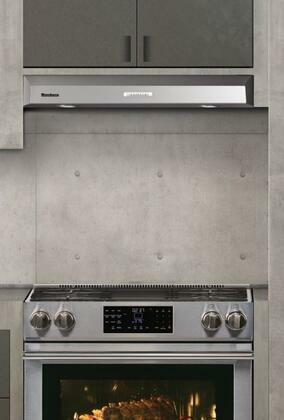 I would recommend this range hood, it looks great, quite easy to install. Product came in very fast without a single scratch. It was packaged extremely well. 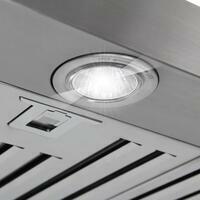 The range hood is beautiful and seems to be of good quality for the price. 1st time buying something without being able to touch it look at it in person. Arrived in great condition no dents or scratches. I've been using it for 2 months now, love the way it works and looks great in my new kitchen.